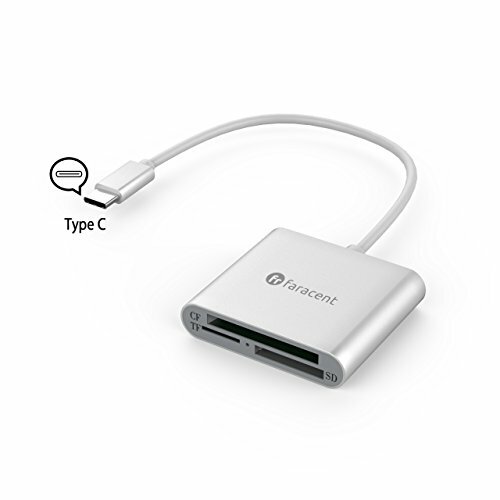 USB C to CF Card Reader, Faracent USB-C to Compact Flash Card Reader, 3 in 1 USB 3.1(Compatible Thunderbolt 3) 5Gbps for CF/SD/TF Micro SD/SD/MD/MMC/S by Faracent at Andy Pemberton. MPN: 4336292155. Hurry! Limited time offer. Offer valid only while supplies last. USB-C interface: New designed for your USB Type-C (Compatible for Thunderbolt 3) computer or tablet. Support 2016/2017 MacBook(Pro), new MacBook 12-inch, Chromebook Pixelfor Surface book. Multi-support:Perfectly support SDHC, SDXC, Micro SD, Micro SDHC (UHS-I), Micro SDXC (UHS-I) and CF Type I/MD/MMC; Ideal for transferring high-resolution images and video recordings. MicroSD, SD, SDHC/SDXC, CF cards up to 3 TB. Super Fast:Up to 5 Gbps data transfer,for faster read and write, higher efficiency for photographic live . Ultra Stable: Contains certified chips, never downtime.Plug and play without any drive install. If you have any questions about this product by Faracent, contact us by completing and submitting the form below. If you are looking for a specif part number, please include it with your message.